Until it was demolished in 1974, the Sailors’ Home in Liverpool was a neo-Elizabethan tour-de-force by the Liverpool architect John Cunningham (1799-1873), with invaluable research on its history published by Stephen McKay here. 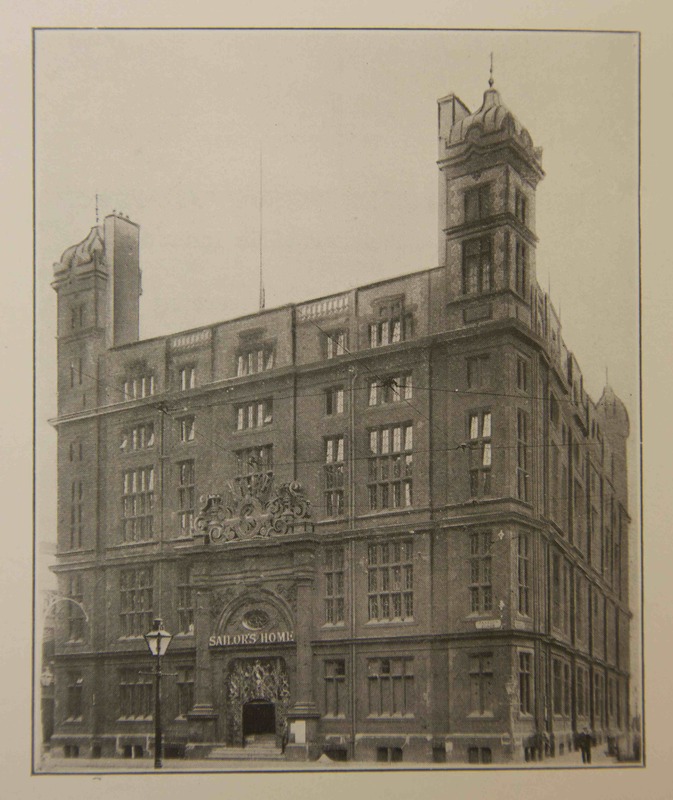 Launched in 1844, the Sailors’ Home project was intended to provide itinerant seamen a place of board and lodging in the city as well as a morally improving environment, with a reading-room, library and savings bank. The ornamental cast-iron gates were installed in 1851, soon after the Home opened, and were designed by Cunningham in collaboration with a local ironfounder Henry Pooley (1803-78), who had already provided ornamental railings and columns for the building’s interior. The gates served the dual purpose of protecting the savings banks attached to the Home and barring entry to seamen who might wish to gain entry to the building after the strict 10pm curfew. 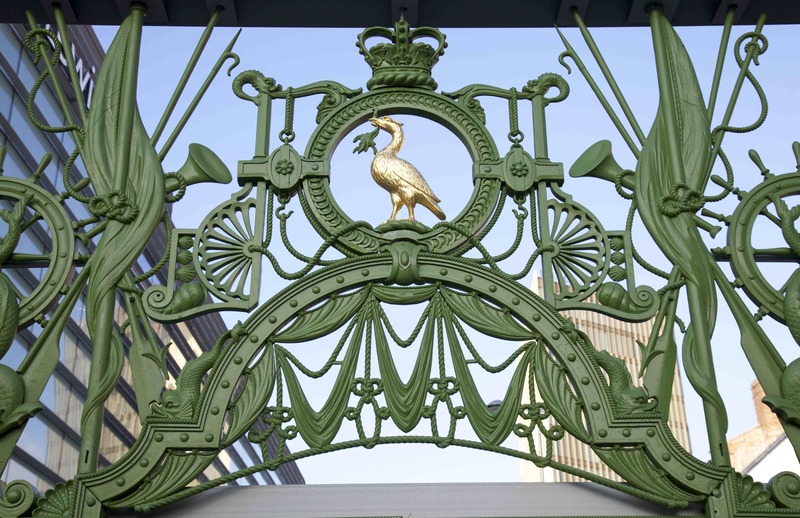 The extravagant ornamentation in the upper part of the gates mirrored the motifs in the sandstone carvings above the building’s entrance and included a welter of nautical motifs – sails, entwined fish, scallops and shells, ropes, horns, and wheels – crowned by a Liver bird, the most familiar heraldic motif of the city. Below, the ornament mirrored that of the balcony railings inside the Home with their exotic double-tailed mermaids supporting tridents and anchors and surrounded by a lattice network of rope. This extravagant ornament was related to the gates’s function as a bar, protecting the security of the building and keeping out unwanted boarders. As seen in photographs of the gates in situ, the ornament of the upper parts filled the area above the entrance, making access impossible when the gates were closed. In addition, Pooley had originally proposed additional spikes to be installed on top the gates to make them more secure, but this had been abandoned after one of the mangers of the Home had expressed his ‘fears as to the consequences which might result … to drunken belated boarders’. Indeed the intimating aspect of these ornamental gates would have more serious repercussions than mere symbolic threat. In the year after they were installed, a woman was killed by the gates after one of the lower panels, weighing half a tonne, fell on top of her. The unfortunate victim – Mary Ann Price – was the wife of the Home’s porter and had been standing next to her husband when the gate slid from its grooves because the chain holding it in place had been detached. Although the subsequent death of Mrs Price was found to be accidental, Pooley was heavily criticised for failing to ensure the safety of the gates and for being slow to redress the defect afterwards. In an extraordinary instance of lighting striking twice, the gates were to kill again: in November 1907, a local policeman was crushed to death by the gates after he sought shelter in the Home’s entrance during a violent hailstorm. Seeing the porter struggling with one of the gates, the policemen went to help but was ‘overpowered by the heavy mass’ which crushed him so severely that ‘he was at once rendered unconscious’ and later died in hospital. Although personally liable for the death, the authorities of the Sailor’s Home wrangled over the compensation to the policeman’s widow, believing that the chains that supported the gates were more than adequate and that human error was responsible for the fatal accident. The gates outside Avery’s historical museum in Soho, Birmingham. The tragic history of the gates may have accounted for the decision to remove them from the Sailor’s Home in 1951. 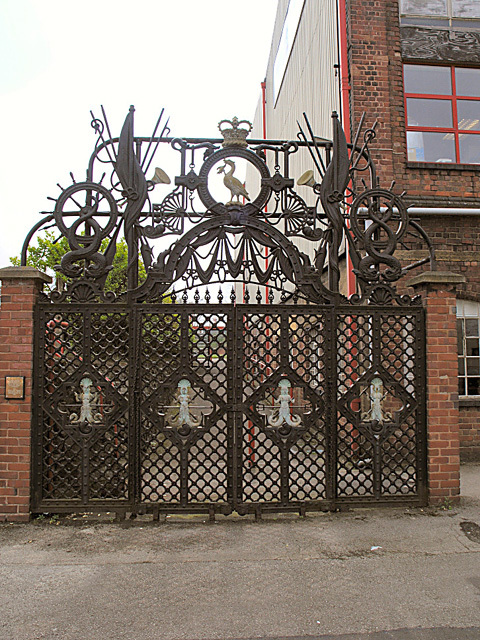 After the Birmingham ironfounder W. and T. Avery took over Pooley’s company in 1948, the gates were offered to Avery and installed outside their historical museum in Soho, Birmingham. Here they were altered to swing like conventional doors rather than slide apart, the upper parts of the gates supported by a wrought-iron frame. 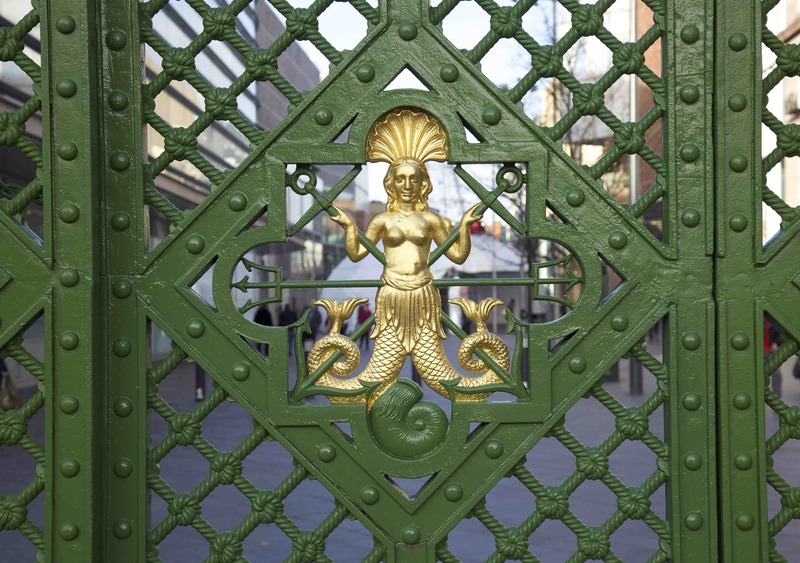 The gates remained here until 2010 when they were dismantled to be restored before being returned to the Soho site. However, at the same time, a campaign was launched in Liverpool to lobby for the gates to be returned to their original location in the city, despite the fact that the Sailors’ Home itself had been demolished in 1974. 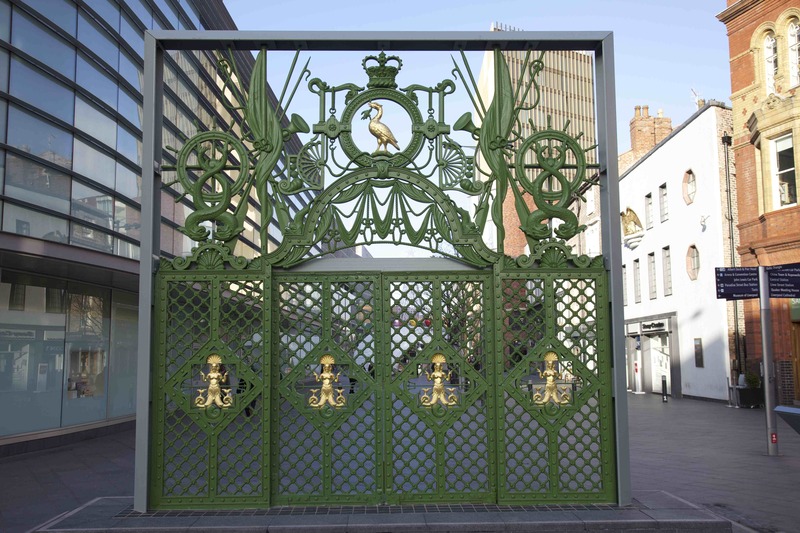 Unveiled on 18 August 2011 by the leader of Liverpool City Council, the gates now stand in their former location in Paradise Street, painted in green and gold to match their original colouring. Now fitted securely inside a steel frame, they no longer function as gates, but rather as a memorial to a vanished history. For all around the gates, Liverpool has been newly transformed: from a post-industrial landscape of ruin and decay to a glittering array of glass-fronted high-end shops and department stores. 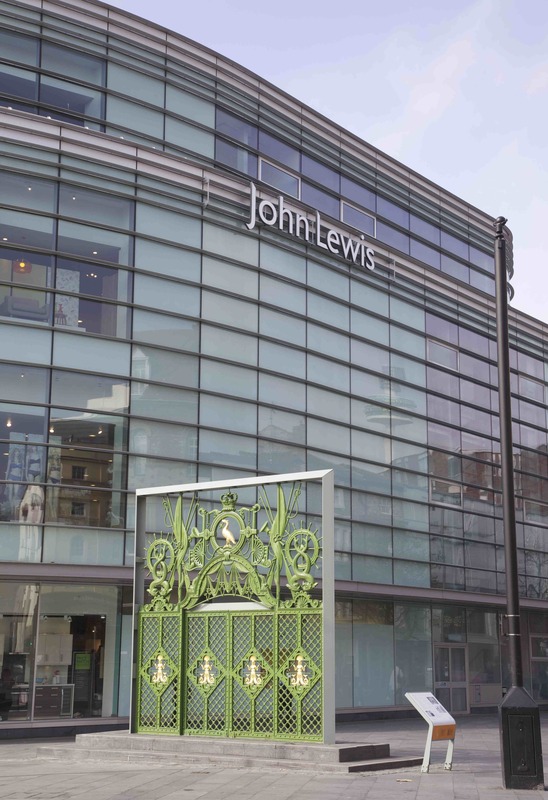 Opposite the newly-installed gates, the shiny transparent frontage of John Lewis now fills the space where the Sailors’ Home once stood. If the gates were meant to bring an historical presence back into this radically dehistoricised environment, they also reinforce the absence of that history, the once-deadly ornament now constrained and domesticated within its sanitised framework and hegemonic surroundings. Quite a story and now a tangible presence of absence. Detail of the ironwork also beautiful.